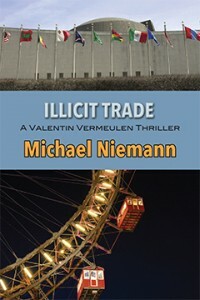 Illicit Trade (6×9 Trade Paperback ISBN: 978-1-60381-589-5, 244, $14.95) is the all-new second book in Michael Niemann’s Valentin Vermeulen mystery/thriller series. The story takes place in New York City, Newark, Vienna, and Nairobi. When two illegal immigrants with forged UN papers are found dead, Vermeulen is assigned to investigate. The case will take him deep into the complicated and dangerous world of human trafficking. 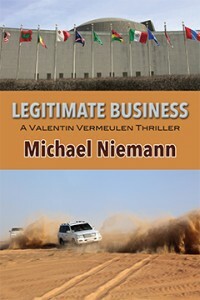 Legitimate Business (6×9 Trade Paperback ISBN: 978-1-60381-587-1, 218 pages, $14.95), which introduces United Nations investigator Valentin Vermeulen, takes place in Sudan. A case involving the death of a UN policewoman in Dafur puts Vermeulen in the cross hairs of powerful arms dealers. “Lee Child has Jack Reacher. Michael Connelly has Harry Bosch. Walter Mosley has Easy Rawlins. Patricia Cornwell has Kay Scarpetta. And Michael Niemann has Valentin Vermuelen […]You don’t need to read the short story and the books in order, like I did, to get the most out of Illicit Trade, but it would be a shame to deprive yourself of the experience.” Read more…. Legitimate Business: Ritu Roy, a constable with an all-female United Nations peacekeeping unit in Darfur, Sudan, has been shot dead. Her superiors call it a random shooting. Her best friend thinks otherwise. She’s found a bullet casing from a sniper’s rifle, an uncommon weapon in the refugee camp. The case remains closed until Valentin Vermeulen arrives to conduct a routine audit. As an investigator with the UN Office of Internal Oversight Services, his job is to ferret out fraud. The casing is the first clue that Ritu may have stumbled onto a major criminal operation. Solving the mystery of Ritu’s death leads Vermeulen down a perilous path. With the help of journalist Tessa Bishonga, he visits the hidden camp of a notorious rebel leader. On the streets of Port Sudan he dodges a parade of shady characters. In the end, Vermeulen must expose the players in the not so “legitimate” business of supplying weapons to Sudan … before they can hunt him down. Illicit Trade: Two poor Kenyan men visiting the U.S. are found dead, one in jail, one on the street. Both used forged UN documents to enter the country. Valentin Vermeulen’s superiors have no interest in the plight of undocumented immigrants, but they want him to stop the fraud. The clues take Vermeulen from New York City to Newark, where he riles a woman known as “The Broker,” then to Vienna. Earle Jackson, a small-time hustler and the last person to speak with one of the dead Kenyans, has taken the man’s passport and money. He also finds a note listing an address in Newark, where his efforts to cash in on the situation go awry. Fleeing for his life, Jackson flies to Nairobi using the dead man’s passport. Vermeulen and Jackson have chanced upon a criminal network more extensive and vicious than either could have imagined. To survive, Vermeulen must do more than sever a few links. He must find the mastermind at the top. Michael Niemann grew up in a small town in Germany, ten kilometers from the Dutch border. Crossing that border often at a young age sparked in him a curiosity about the larger world. He studied political science at the Rheinische Friedrich-Wilhelms Universität in Bonn and international studies at the University of Denver. During his academic career he focused his work on southern Africa and frequently spent time in the region. After taking a fiction writing course from his friend, the late Fred Pfeil, he switched to mysteries as a different way to write about the world. For more information, click here. Since moving back to New York, Vermeulen had quickly adopted the empty refrigerator habits of Manhattan residents. That wasn’t a problem on most days, since there was so much prepared food available everywhere. But he didn’t feel like going out again. Besides the beer, his fridge contained a jar of pickles, four eggs, some packets of soy sauce from the Chinese place down the street, and an old bagel. That limited his culinary options. He was in the middle of frying two eggs when his phone rang again. The spatula clattered on the stovetop, then to the floor. He stared out the window as if the mysterious caller were right outside, looking in at him. The eggs sizzled in the hot pan. “Hold on,” Vermeulen said and put the phone down. Who the hell was this? It obviously wasn’t the woman with the short blonde hair. And it wasn’t the doctor. He reached down to pick up the spatula. He turned down the burner. Nobody else knew he’d stopped by the doctor’s office. He tried to remember faces he’d seen on the street. There was really only one candidate—the black man who’d followed him. The silence at the other end told him he was right. The eggs were done. Vermeulen managed to slip them onto the plate. He popped the bagel halves from the toaster, pulled over a stool, and sat down. This might take a while, and he wasn’t going to let his eggs get cold. The last comment was pure bluster. He took a bite from the bagel and had another swig of beer. He finished the eggs and wiped the remaining yolk with a piece of bagel. “Nah, let’s just forget the whole thing, okay?” the caller said. The sky had become overcast. The air stood still, and sweat beaded on Vermeulen’s forehead. He didn’t care. The mix of nervous energy and anticipation he knew from his previous cases was back. “We must head back. It’s too dangerous without backup,” Gupta said. Wambui inched the Nissan along the bumpy dirt until they reached the end of a row. Before they reached the third row, they saw people run toward them. Wambui nosed the car to the corner and stopped, half concealed by a hovel. Three hundred feet down the row stood two pickups with heavy machine guns mounted on their beds. Several men stood near the trucks. One of them leaned against the gun on the first truck. Wambui stopped. “Technicals are the preferred fighting vehicles of the rebels,” Tessa said, as if Vermeulen didn’t know that already. “What are they doing here?” Vermeulen said. “That could be Amina’s place,” Tessa said. Wambui put the Nissan in reverse. “No! We can’t go against two technicals. Those are .57-caliber machine guns,” Gupta shouted. Vermeulen climbed from the Nissan and walked slowly toward the men. Their guns hung from their shoulders. One gestured to another, and he heard laughter. The machine gunner’s arms and head rested on the gun. They were relaxed. The trick was not to surprise them. He shouted “Hello!” and waved. The gunner on the technical looked up, saw Vermeulen, and cocked his head. Taking his time, he swung the long barrel toward the stranger. The other men turned to look at him. Two pulled their rifles from their backs, also moving at a leisurely pace. They didn’t look like AK-47s, not that it mattered. At this distance even an old hunting rifle would do serious damage. It was too late to turn around now. That much was clear. The fifty yards between him and the pickups seemed much longer. Raising his hands in the international sign of surrender, Vermeulen kept going.